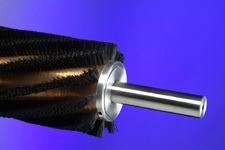 The Industrial Brush Company continues to manufacture a wide variety of cylinder brushes for the printing, paper manufacturing and converting industries. Whether you are printing or converting Newspapers, Magazines, Paper Towels, Toilet Paper or Corrugated products, we are there to provide quality results for our customers. Each brush is manufactured using components that endure the effects of their environment. 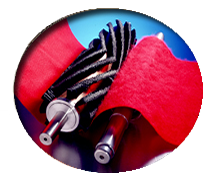 Great care is taken in the selection of bristle type to withstand caustic and abrasive environments typically present in the printing and paper industries. 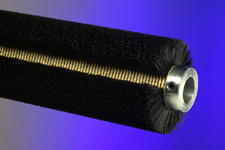 All of our brushes are manufactured to exact tolerances to insure proper fit to your machine. Use of our brushes will result in reduced down-time, and improvements in printing and converting quality. Only our "Fineset" pattern allows each individual filament to interface the product equally across the entire face of the brush. 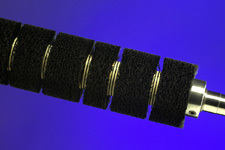 There are no open spaces or wraps of helical wound bristles. This full uniform pattern optimizes performance, extends life and reduces contamination. We encourage you to contact us for additional information. 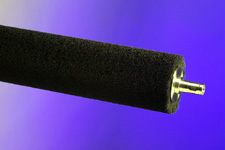 Our extensive OEM data base is a resource that you can rely on for quality replacement brushes at affordable prices.